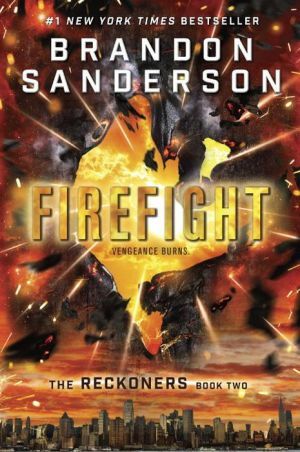 Brandon Sanderson, the #1 New York Times bestselling author of Words of Radiance, coauthor of Robert Jordan's Wheel of Time series, and creator of the internationally bestselling Mistborn Trilogy, presents the second book in the Reckoners series: Firefight, the sequel to the #1 bestseller Steelheart. They told David it was impossible, that even the Reckoners had never killed a High Epic. Yet Steelheart--invincible, immortal, unconquerable--is dead. And he died by David's hand. Eliminating Steelheart was supposed to make life simpler. Instead, it only made David realize he has questions. Big ones. And no one in Newcago can give him answers. Babylon Restored, the city formerly known as the borough of Manhattan, has possibilities, though. Ruled by the mysterious High Epic Regalia, Babylon Restored is flooded and miserable, but David is sure it's the path that will lead him to what he needs to find. Entering a city oppressed by a High Epic despot is risky, but David's willing to take the gamble. Because killing Steelheart left a hole in David's heart. A hole where his thirst for vengeance once lived. Somehow, he filled that hole with another Epic--Firefight. And now he will go on a quest darker and even more dangerous than the fight against Steelheart to find her, and to get his answers.